#Residents of #Denmark, see here! Are you aware that your tax dollars are used to your country using the military to pull out to the Faroe Islands and arrest a group who only wants to save pilot whales from being slaughtered? 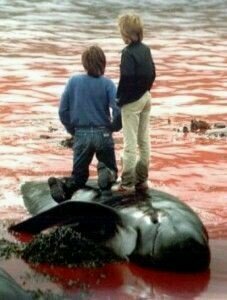 Denmark is breaking the law to do this because Europe is Anti Whaling so what do they do there? Unnecessarily much of your tax money is used to this. It is not right to put someone in jail for something they wanted to protect which is an innocent Pilot Whale. Last week I published a picture of a boy belonging to the Faroe Islands to keep a fetus in his hand taken from his dead mother. Faroeses allows namely their children (age does not matter) be with and learning to kill at an early age. Tax money should go to this.